← Dell Latitude E7440 – Using a MSATA SSD in the MSATA WWAN Port = Yes, you can! 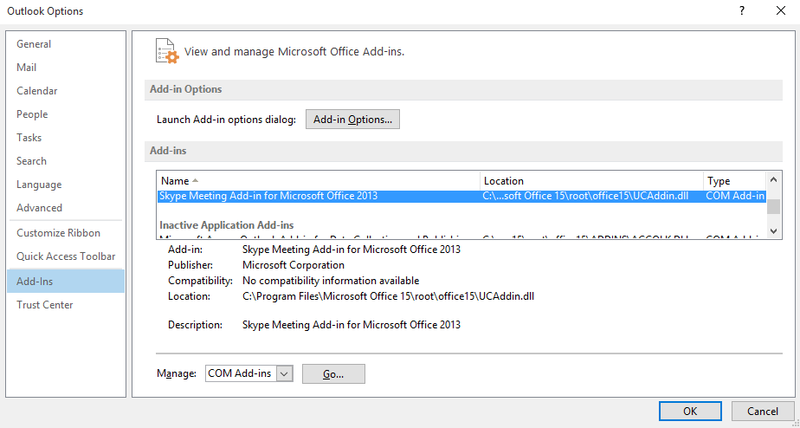 You want to use the Lync/Skype for Business Add-in (UCAddin.dll) within Outlook, but the button within the calendar isn’t at place every time you start Outlook. You go into Add-Ins, check that it is not disabled (Manage: Disabled Items) and then select the checkbox for the Lync/Skype for Business Add-in (Manage: COM Add-ins) and then the button appears again and can be used. But the next time you start Outlook the button disappeared again. Now you think that there is a problem with the Add-in and start searching within the Event logs (Administrative Events) and try to figure out SidebySide (SxS) problems, but this didn’t helped out out here either. Finally you need to look for two things. First: Are there any Slow And Disabled Add-ins listed under File – Info – Manage Add-Ins? If yes, than enable the disabled Add-in here. Secondly: Check the LoadBehavior of the Add-in in question within the registry under HKCU\Software\Microsoft\Office\Outlook\Addins and set it to 3. This entry was posted in Computer und Internet and tagged Outlook. Bookmark the permalink.